Growing up, I was not a picky eater (still am not), and certainly wasn’t one of those kids who hated vegetables. My brother went through a phase where he hated carrots and hated peppers, but veggies never bothered me. That said, one vegetable I didn’t get much exposure to when young was the ruby red beet. I suspect my father doesn’t care for them and that’s why they never graced the dinner table, but I decided recently I was at a point in my life where I wanted to explore the less conventional vegetables in order to spruce up meals. After whipping up a beet & pear salad last week (with some kohlrabi tossed in just for kicks), I realized that raw beets are: a) really delicious, and b) actually quite sweet! I’d had pickled/jarred/canned varieties of beets before, and they are nowhere in the same league as fresh, raw beets. Heat a cast iron skillet (or your grill!) over medium heat and put a drizzle of olive oil in the pan. Season your steak with salt and pepper on both sides, then place in the hot pan. Cook for about 3 – 4 minutes on each side, or until meat is medium rare. When cooked to desired doneness, remove from heat and cover and let rest for 5 – 10 mintes. When meat is rested, slice into thin slices. While meat is resting prepare your beet & apple slaw. In a bowl, combine your beets and apples. In separate container, mix lemon juice, honey, and olive oil together to make a vinaigrette. Add in some salt and pepper for seasoning, and the finely chopped parsley. Drizzle over the beets & apple! Voila! Slaw done! In a large pan, heat some oil over high heat and toast your corn tortillas. I like to get them a little crunchy, but the key is to heat them through so that you can fold them up without them ripping. Assemble your tacos. 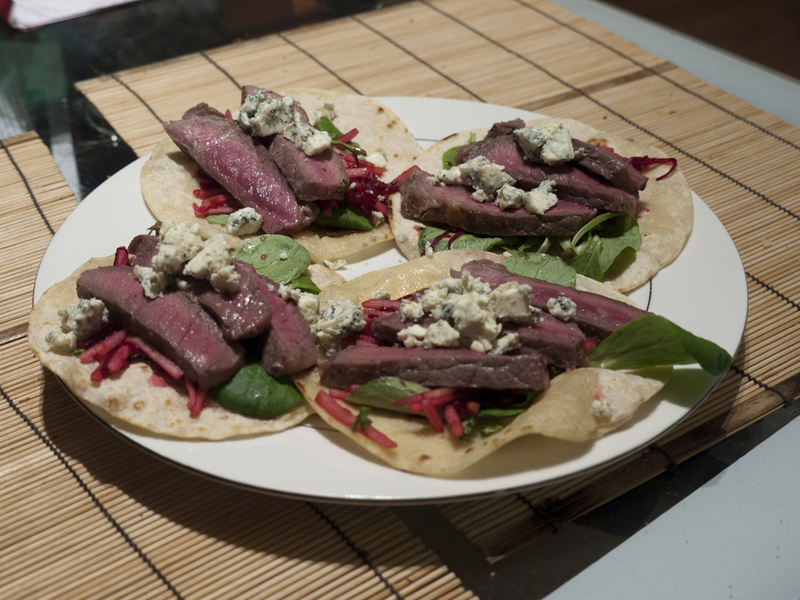 I placed some mache greens, then the slaw, then the steak, and finally some blue cheese crumbles over top. Devour! This was SO TASTY! It may be one of my new favorite dishes. All of the flavors really worked well together. 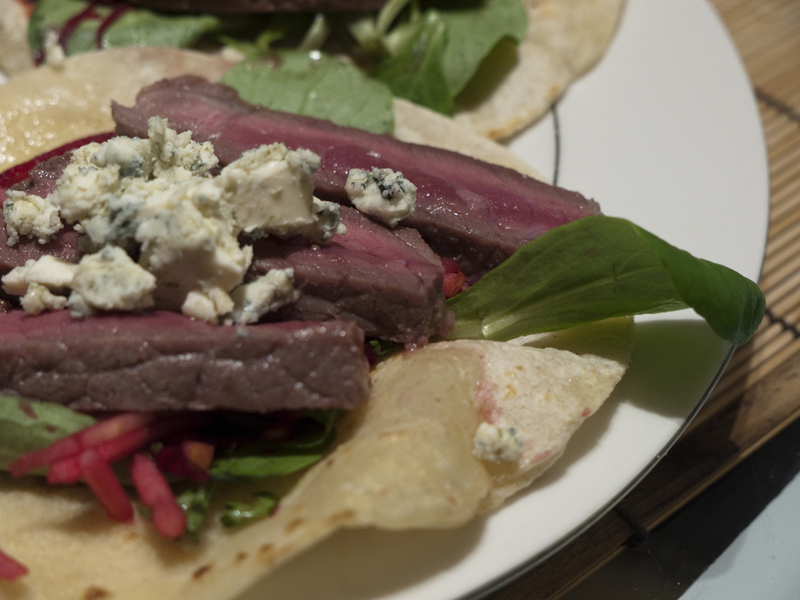 Steak and blue cheese are always a good combination, but the added sweetness and acidity of the beet & apple slaw really took things too a new level. Plus I loved the nuttiness of the toasted corn tortillas. I ate four of these little babies and didn’t feel at all bad about it because they were just so darn good. Plus, they are so simple to whip together, making them perfect for a weeknight meal. But they seem fancy enough that if you wanted to make them for guests (or hors d’oeuvres at a party), you could absolutely do that too. All I know is that you need to make these because they are so scrumptious. Certainly one of my best creations to date! Oh wow, Steph, this looks absolutely *incredible*! I can’t wait to try it! I actually love beets, but my family thinks I’m crazy for wanting to include them in our dinners. They really are an unloved and misunderstood vegetable. There is a great restaurant here that changes it’s entire menu by the season, and one of the things I love about their fall line up is that they serve most of the dishes with roasted golden beets. I think that the only beets people are really used to are the pickled variety that is seen around the holidays, which is a shame, because they are so, so good! I like this recipe and think it sounds like something that would be very different than the normal beef and chicken tacos that we normally serve. I do have a question though: do you get most of these amazing recipes from books or websites, or do you just make them up on your own? This looks great, and a wonderful way to sneak beets into my husband (he’s like those kids that you have to sneak vegetables into other foods for them). I never thought of them with blue cheese before but it sounds really good! @ Sim: Please do try it and let me know how it turns out! @ zibilee: I do a combination of following recipes (or using them for inspiration) and just doing my own thing. This meal was totally born out of my own brain, so I’m really pleased it worked out so well! Also: so easy! @ rhapsody: There are so many flavors going on in this dish, I think your husband wouldn’t mind about the beets. They definitely add some depth, but they aren’t the star, so picky eaters won’t hone in on them. Please do give it a try! and now I am drooling as well. looks and sounds yummy. @ diane: These were so good! If it’s possible, they tasted even better than they looked! Just finished dinner and these were fantastic! I made a couple of modifications because I didn’t have the right ingredients on hand (flour tortillas instead of corn and basil instead of parsley) and they were still a huge success! Thanks for sharing this! @ Anon (Simona! ): I’m so glad these were a hit, and your modifications sound great! I’m glad you put your own spin on them! What did you think of the raw beets? I made this recipe tonight for my weekly “Taco Tuesday” date with a friend. I really liked it but I thought the steak I made could have used more flavour. I am not a very experienced cook so I was hoping to get your suggestion: can you recommend a marinade that would go well with the beet/apple salad? @ Emily: Thanks for commenting and letting me know how it went! If you want to marinate your steak before hand, I might try leaving it overnight in a container or ziplock bag with some of the following: chili peppers, ginger, soy sauce, green onions, a little brown sugar. That should infuse it with plenty of flavor! It’s a little bit more asian, but it’ll have complex flavors that should complement the beets & apples rather nicely. If you give it another whirl, please let me know how it turns out!